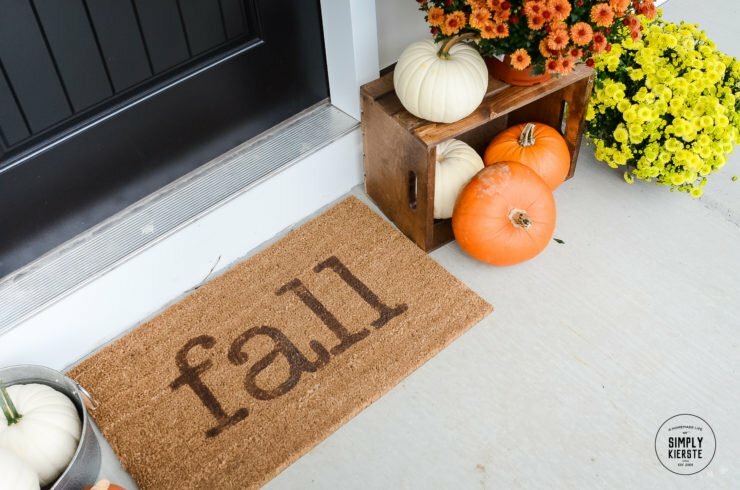 This adorable fall welcome mat literally takes 10 minutes from start to finish, and adds the perfect touch to your front porch! Adorable, right? And such a fun and simple project too! 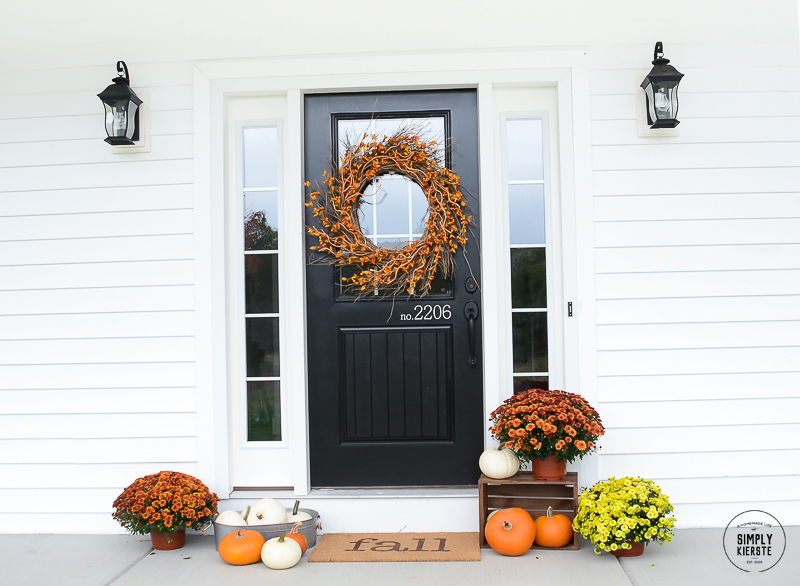 It just makes my whole front porch, and the fact that it’s so fast and easy is the icing on the cake. 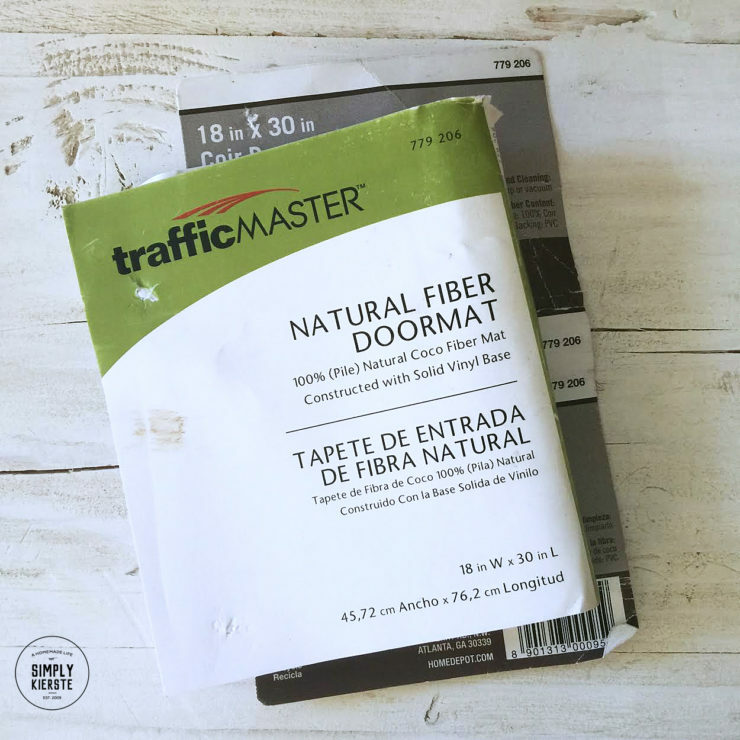 I found my door mat at Home Depot for less than $10! You an also get one HERE on Amazon! 2. I cut my stencil out on my Silhouette Cameo, using the font American Typewriter. I wanted it to fill most of the rug, so I made it pretty large. 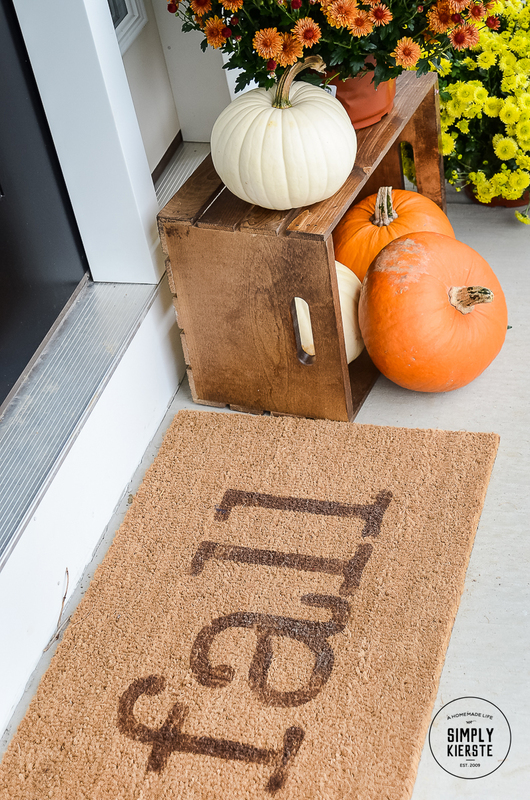 It was really tricky to try and make the vinyl stencil “stick” to the mat, and it never really did. I pressed it down the best I could, and because the mat I used was really, really stiff, (which is common for outdoor rugs), it was actually fine in the end. Even though it wasn’t sticking really well, because the fibers were so stiff, the paint went on really easily. 3. I used Americana Dark Chocolate craft paint and a foam brush to apply the paint to my stencil. Like I said above, I was worried at first about the stencil not sticking really well, and the possibility of the paint seeping underneath it. But I dipped my brush in the paint, then just dabbed it up and down, never making any side-to-side motions. 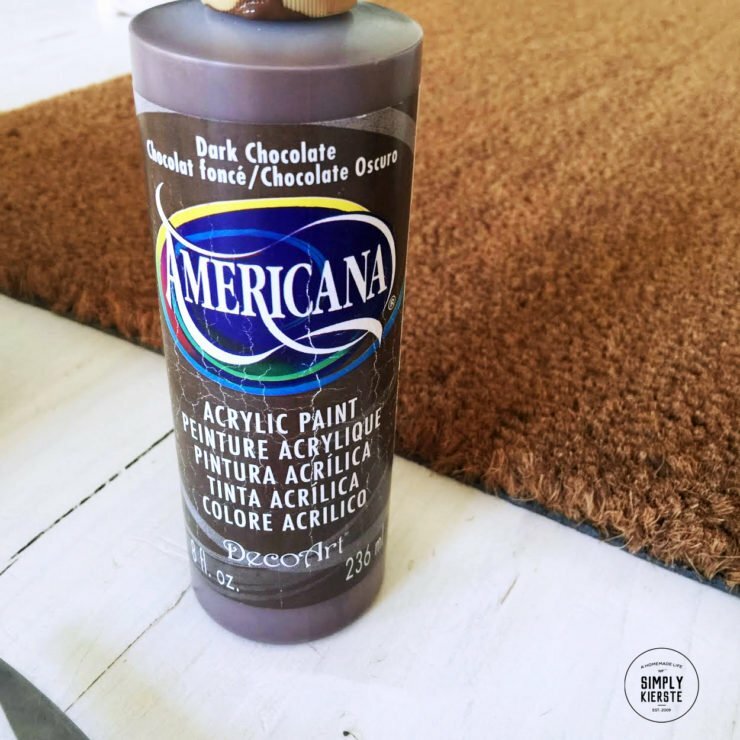 The mat’s stiff bristles were really absorbent, and the paint went on really well–it didn’t go under the stencil at all. 4. As soon as I finished adding the paint, I removed the stencil and let the paint dry. It took about 10 minutes to make, and maybe another 30-45 for the paint to dry–that’s it!! Very cute. I love your new home and watching all the decorating. 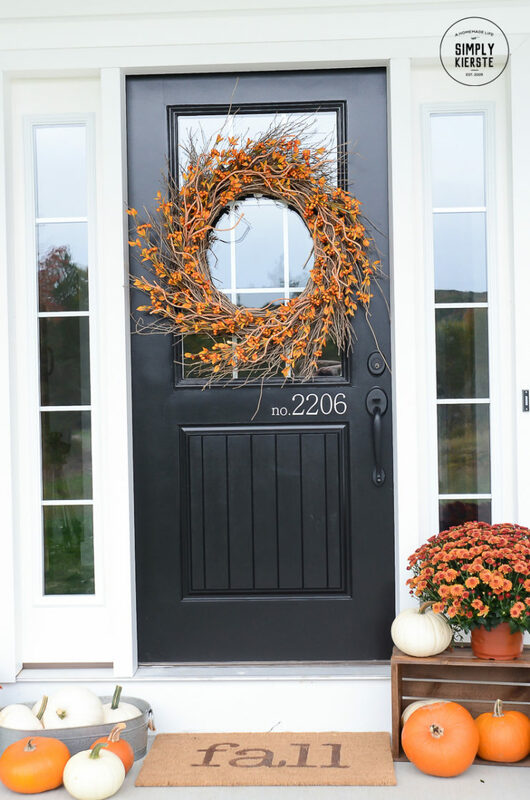 How do you hang your wreath on the front door? Very cute. 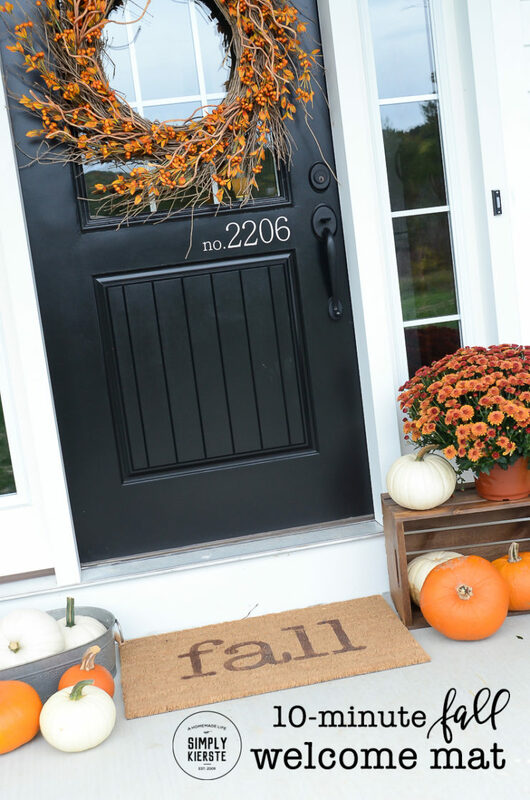 Did you stencil the house number on your front door the same way? I am starting to think I need to invest in one of those Silhouettes. You have made so many simple and cute projects with yours. Where did you get that wreath!? I LOOOOVE it! It’s from the online Magnolia Market! I got it on clearance last fall, and I love it SO much too!! Cute front porch…you are very creative!